Welcome to another instalment of The Meta Report. The past weekend yielded a slew of major tournament results. There was Grand Prix Indianapolis which gave us some exciting new Standard results (spoiler alert: Jace is no longer king). The first Modern Grand Prix since rotation took place at Porto Alegre, and while Battle for Zendikar did not exert the level of impact Khans of Rhino and Cruise had on the format, a few new cards managed to slip into Modern. 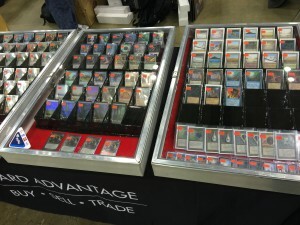 There was also the StarCityGames Modern Open at Dallas-Fort Worth. Welcome back to another instalment of The Meta Report, where we track the evolution of the metagame week-by-week and its financial implications. This week we would only be taking a look at the Magic Online metagame as we’ve already had a look at last week’s sole paper event, Grand Prix Paris in the previous instalment of The Meta Report. Without further ado, here’s the table for the most popular decks on Magic Online daily events over the past week. The top dogs remained mostly unchanged from last week’s meta, with Abzan Aggro, Mono Red and Esper Dragons retaining their spot as the three most popular decks. 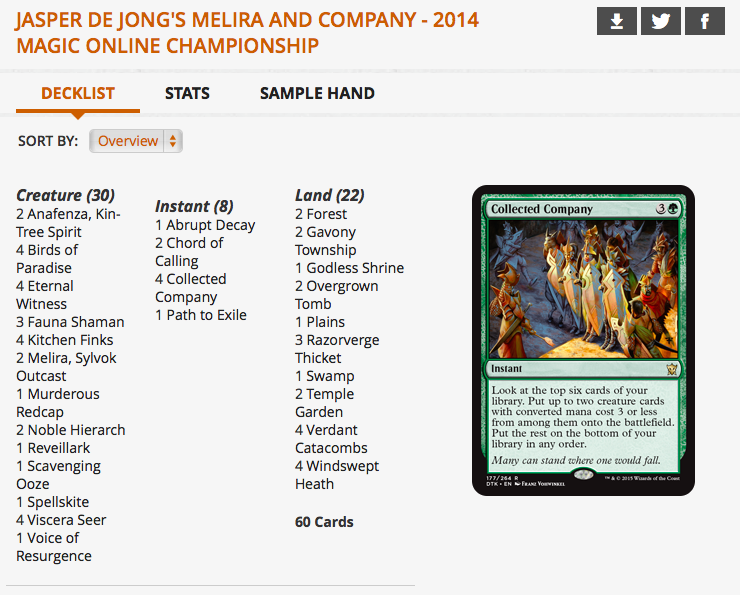 However, this week saw Green White Collected Company Megamorph (a rather inelegant name for the Green White Aggro deck which utilizes the megamorph synergy in Den Protector and Deathmist Raptor and runs four copies of Collected Company) and Mardu Dragons gaining traction. As last week’s article pointed out, Mardu Dragons was well-positioned in the metagame and it is no surprise to see the deck nabbing a larger portion of the metagame last week. Mardu Dragon’s rise could also be attributed to it being one of the few tier one decks that is cheaper than the rest: you do not need Dragonlord Ojutai or Deathmist Raptor – two of the most expensive Dragons of Tarkir cards online (and on paper too) for Mardu Dragons. Unfortunately the rise of Mardu Dragons has little financial implications as the components of the deck are either cheap or stagnating in price. Soulfire Grand Master experienced a slight bump over the last couple of days but her buylist price remained the same, pushing her spread to 56%. Nothing to see there. My call on Collected Company is still a sell call. I expect its price to remain at its current price of $9.65 or slightly dip in the face of Dragons of Tarkir redemptions hitting the market in a few days. Even if you decide to hold it, I don’t think you would stand to lose much if its price does not grow. I suspect Collected Company would retain a price of $8 – $10 for the next few months, especially with the swap to Modern PPTQs in June. An old mythic that is seeing a bit of a resurgence in the metagame is Perilous Vault. The online meta last week saw Esper Dragons adopting a few copies of Perilous Vault to combat the persistent Deathmist Raptor and Den Protector synergy. With just a few months left in the meta, I am not expecting Perilous Vault to spike again, but it may be worth holding on to your copies to see if its adoption translates into paper, which could bump its price up by a few bucks as it is a core set mythic. 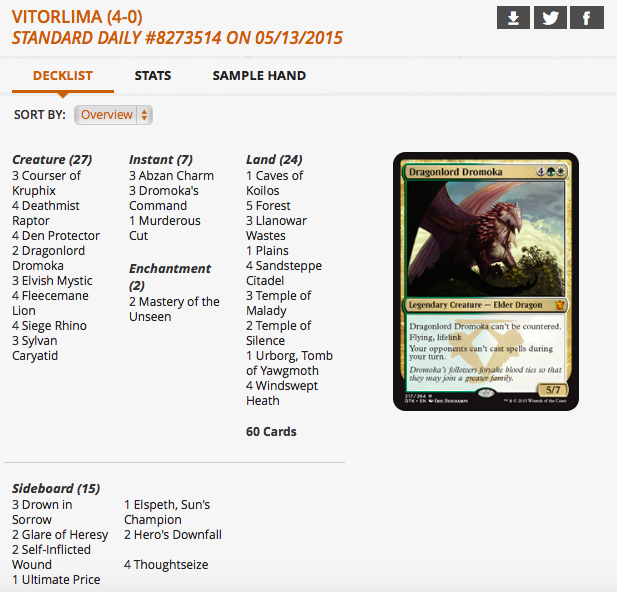 Temur Ramp surfaced a couple of weeks when Andrew Cuneo brought the list to the Standard Super League. The deck appeared once or twice in the daily events in the two weeks following it. 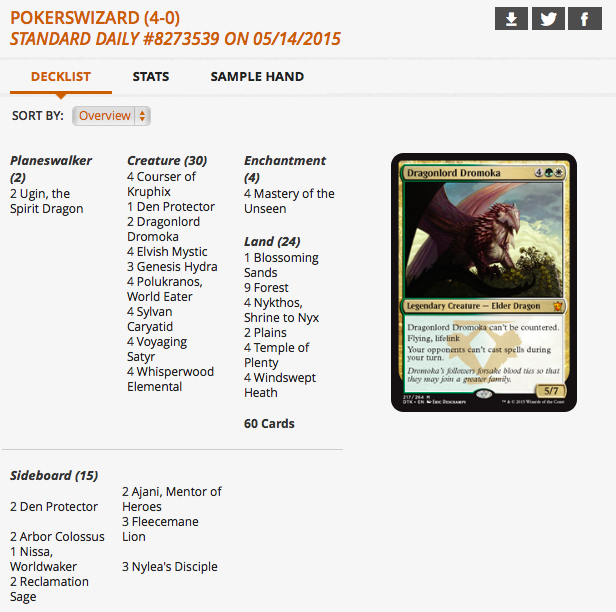 However, last week saw five copies of Temur Superfriends finish in the money in the daily events. 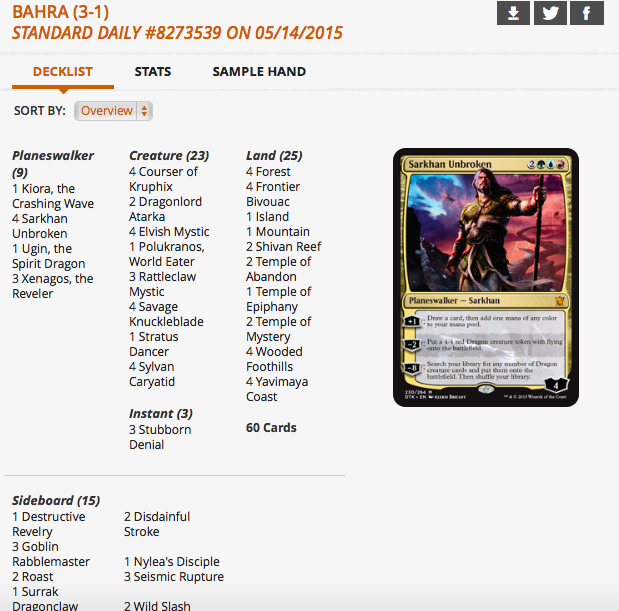 Below is a list from Magic Online streamer Bahra. 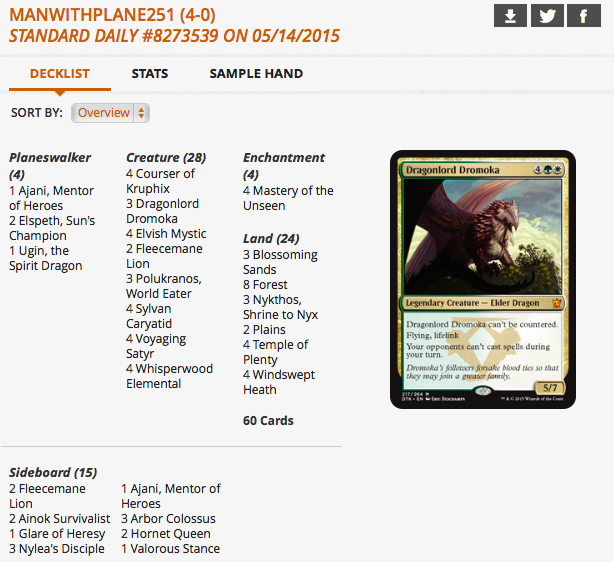 Temur Ramp features a suite of nine Planeswalkers including a playset of Sarkhan Unbroken. Living up to his name, the new iteration of Sarkhan has yet to be broken. While Sarkhan Unbroken’s abilities will always be a two-for-one, his tricolor casting cost significantly restricted the type of decks that could run him. Temur Ramp, a midrangey Superfriends deck with ramp capabilities, seems to be the shell that fits Sarkhan Unbroken best in the current Standard metagame. 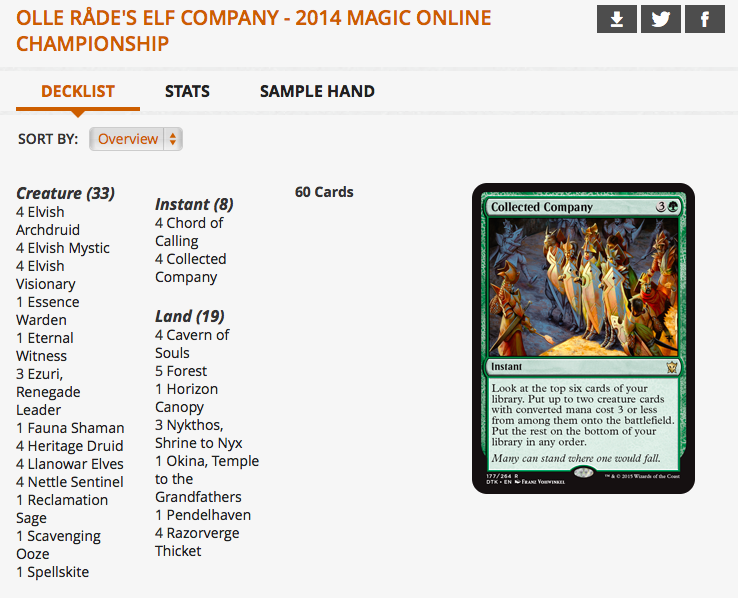 The only qualms I have with the deck is its flavor fail: Ugin would kill Sarkhan with his -X ability. 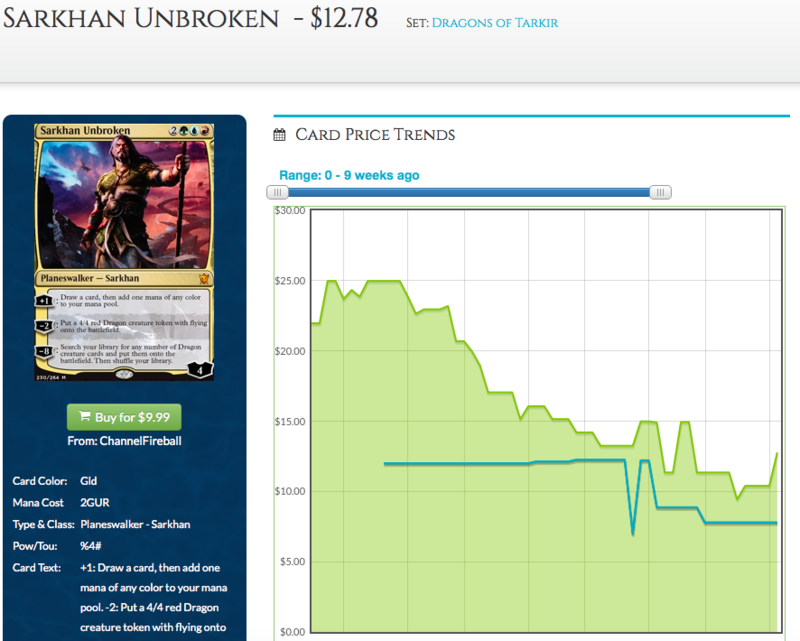 On a downward trajectory since the release of Dragons, Sarkhan Unbroken dipped below $10 briefly and is starting to climb although his buylist remained the same (spread of 38%). However, at $12.76, Sarkhan Unbroken looks to be a superb buy right now. 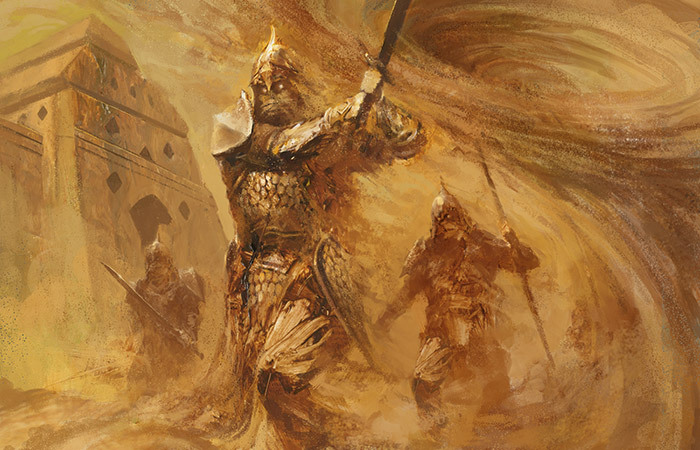 Dragons of Tarkir drafts are going to be drastically reduced in a few weeks’ time and if Temur Ramp ramps up to tier one, Sarkhan could easily be a $20 card. I am putting a strong buy call on Sarkhan Unbroken. 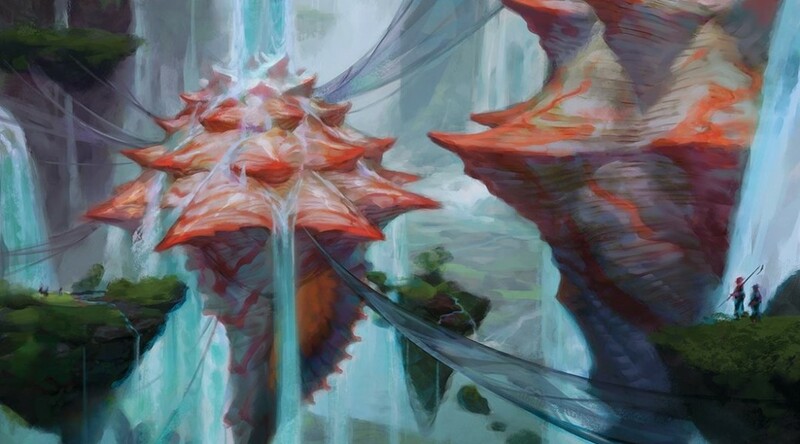 While the most popular decks in the Magic Online metagame remained roughly the same as the previous week, a couple of decks featured a spicy new addition. Can you see it yet? I guess the picture gave it away. Dragonlord Dromoka is finally seeing some mainboard action. 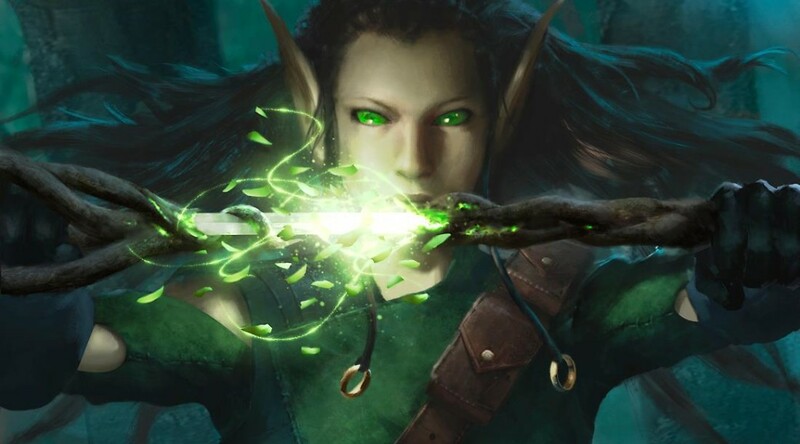 Up till last week, the only time she saw action was as a singleton in a sideboard of Robert Vaughn’s Abzan Megamorph deck which went 9-0 at Grand Prix Toronto. 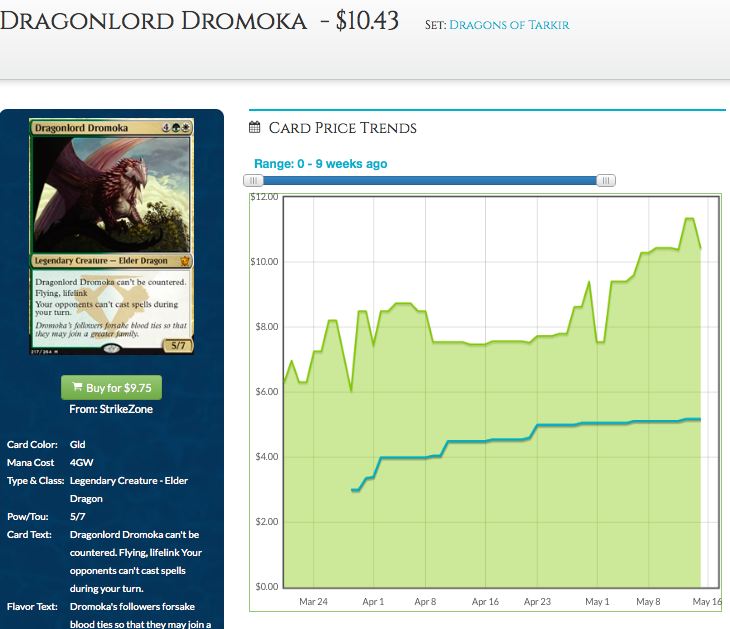 Dragonlord Dromoka’s price has been on the uptick for a couple of weeks. 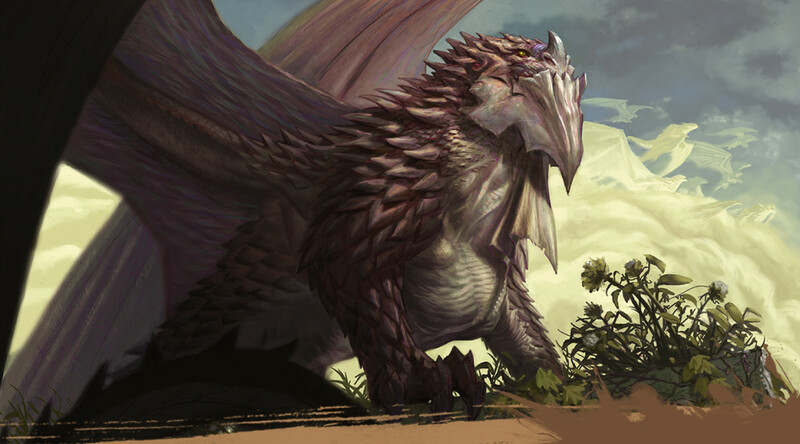 If Dragonlord Dromoka’s promotion from a sideboard singleton to two-to-three copies in the mainboard of Abzan Megamorph and Green-White Devotion translates into paper, she could very well demand a price tag of $15. While I am confident about Dromoka hitting $15 if the tech above does well on paper this weekend, I am not sure if she could hit $20, with the other Dragonlords, Deathmist Raptor, Collected Company and Narset Transcendent (whose price is also experiencing an uptick) soaking up the bulk of Dragons of Tarkir‘s set value. Grand Prix Shanghai is going on as of writing and Japanese brewmaster, Makahito Mihara brought a sweet Dragon Megamorph brew that featured the megamorph synergy and a host of Dragonlords including two Dragonlord Dromoka in the mainboard. Mihara piloted that deck to 9-0 on day one but unfortunately, he fell short of top 8 by one or two wins (annoyingly while the top 8 has been announced, the results page has yet to show round 15). I have been bullish on Dragonlord Dromoka’s ability to make her mark in Standard, and I remain so. She has a throng of useful abilities for just six mana. She is a card you would want to see in your hand against every single deck in the current metagame. Her lifelink and seven toughness makes her exceptional against the aggro decks, and makes her exceptionally difficult for decks without access to Valorous Stance, Abzan Charm or Hero’s Downfall to handle without losing card advantage. Her uncounterable clause and Grand Abolisher clause are useful against Esper Dragons, plus she blocks Dragonlord Ojutai favorably. I am putting a trade for call for Dragonlord Dromoka. I tend to err on the conservative side in making calls in this column. While I am tempted to put a buy call on her due to her highly favorable position in the metagame right now (and a good chance of exploding into the metagame), $10 is a steep buy-in for a card whose most probably short-term ceiling is $15. Then again, there is a real possibility for Dromoka to hit $20 if she becomes prevalent in the metagame after the supply of Dragons dries up to a trickle in a few weeks’ time. She has a high spread of 50% at the moment, there is time to secure your spec copies in trade. Oh and secure your own playset now if you plan on playing with Dragonlord Dromoka. Gone are her time below $10. That is all for this week. Join me again next weekend for another instalment of The Meta Report. Do share your thoughts and questions in the comments section below or catch me on Twitter at @theguoheng.